Spray starch is a traditional aid for ironing. With spray starch, you can enjoy crisp collars and pleats. Quilters find it is one of their best tricks for piecing different fabrics and weaves, making and applying appliques. For many sewing projects, a bit of spray starch can make the job easier. Besides, starching clothes makes them last longer because dirt and perspiration stick to the starch and not to the fabric. Here's how to make your own spray starch with items you already have in your pantry and save substantially. Combine the cornstarch and water in a bowl and stir until the cornstarch is completely dissolved. (The mixture will be milky in color.) Add 1 to 2 drops of essential oil for fragrance if desired and mix well. Transfer the mixture to a clean spray bottle and use. Label the bottle "Spray Starch," and you might want to add, "Shake well before each use" to remind yourself of that crucial step. Your homemade spray starch should last for a couple of months, but it can eventually degrade. Toss it if you see any mold or if the solution becomes discolored. Some people prefer to heat the water to dissolve the cornstarch first. Do this by heating 2 cups water in a pan on the stove until boiling. Add the 1 heaping tablespoon cornstarch, boil for 1 minute to dissolve. Cool the starch mixture before transferring it to the spray bottle. For best results, shake well before each use. The starch will settle, and it needs to be remixed with each use. A little goes a long way, so use sparingly. 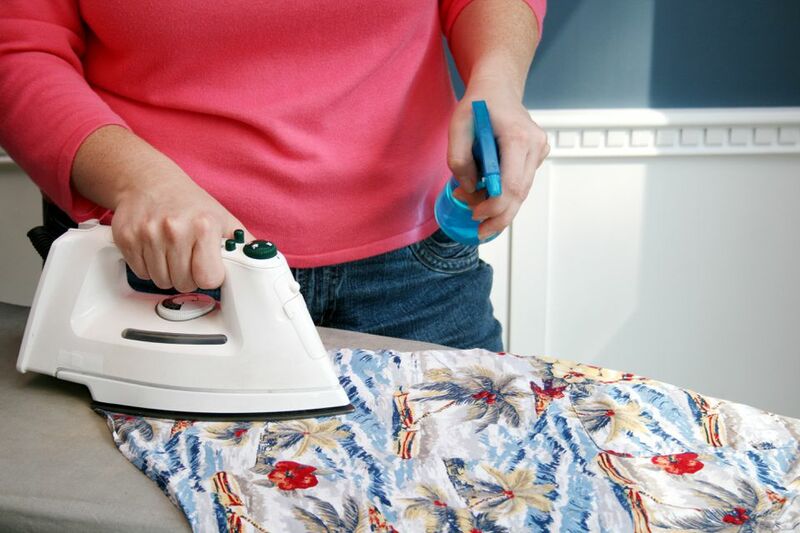 If you get starch build-up on your iron, wet a cloth with white vinegar and iron it. This will refresh your iron. You can buy spray starch in aerosol cans. These, of course, contain propellants that are often flammable alcohols. They also contain other additives that keep the starch in solution and keep it from degrading. This may include formaldehyde and other chemicals you are probably better off avoiding. Often a fragrance is added, which can be an allergy trigger. If you get a headache or sniffles when using scented products, this could be a culprit. Eco-friendly brands come in spray bottles and are made with cornstarch, as is done here. However, you can make your own for pennies. By using this recipe, you have full control of the amount of starch and whether you include a scent or not. You also won't be disposing of the cans or bottles. Are You Using Single Dose Laundry Pods Correctly? Store Brand vs. Brand Name Laundry Detergent: What's the Difference? So How Does Laundry Detergent Really Work? Is Bleach or Baking Soda Better for White Clothes? Is Purex Crystals Laundry Enhancer Right For Your Laundry?